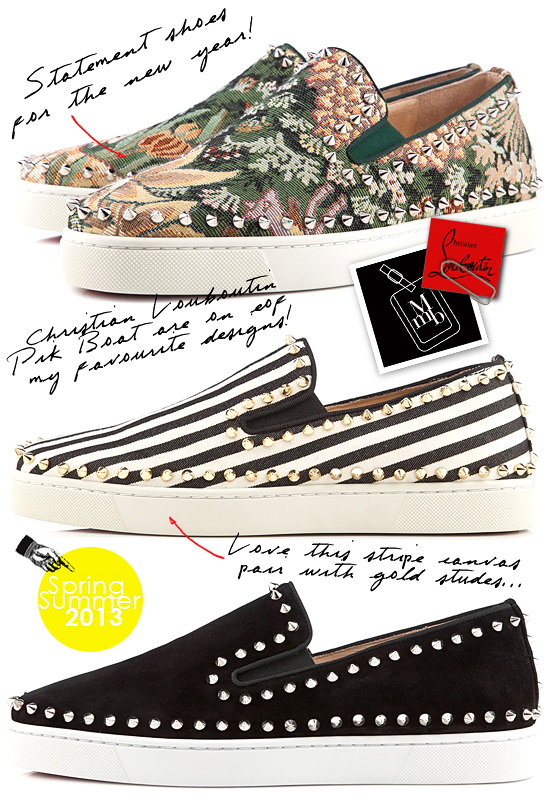 This first day of the Chinese New year... Let me continue my drooling over Christian Louboutin's gorgeous Spring Summer 2013 mens collection. How appropriate that I am eyeing on some python skin trainers from the new collection, combined with a street edge with Christian Louboutin brash luxury. Yes, I am talking about those new multi-colour python Louis Flats (USD1595) and Rantus Orlato Flats (USD2395) which pushes python glamour to new levels. The colouring of the skins makes the trainers fun and unique, especially the Rantus Orlato Flats which has hand painted tribal looking patterns. If colour is not your thing, go for the stone coloured python version (USD1495) which is classic and transcends all seasons, definitely a keeper for a long time to come. The trainers may be gorgeous in its own right, but my heart are set aflutter once I see the new Pik Boat designs. 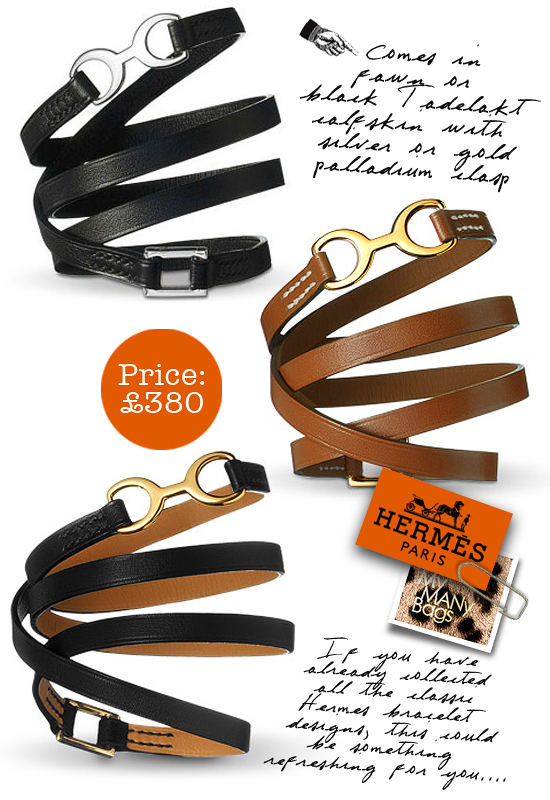 Choose from refreshing tapestry canvas (USD845) to nautical B&W stripes (with gold studs!) (USD 845) which are statement footwear and yet being highly appropriate for daily wear. Added with a sparingly touch of spikes, they embody the right amount of street edge with luxury. Now you have more reasons to do more rounds of house visiting and get more red packets to finance your Christian Louboutin lusts! 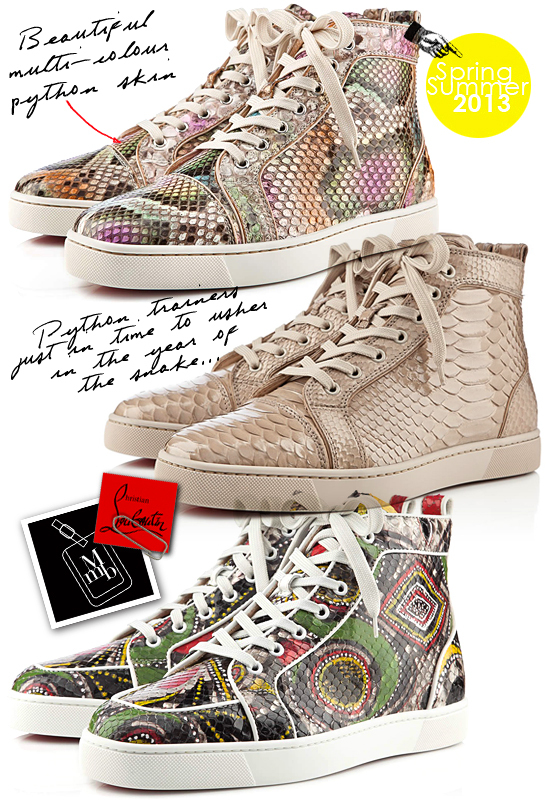 More pics of Christian Louboutin SS2013 Mens Shoes (Part 2) on my facebook fanpage. 'LIKE' my fanpage if you enjoy reading this post.